T cells and B cells are the two types of lymphocytes that are involved in triggering the immune response in the body. Both T cells and B cells are produced in the bone marrow. The T cells migrate to the thymus for maturation. Both T cells and B cells are involved in recognizing pathogens and other harmful, foreign materials inside the body such as bacteria, viruses, parasites, and dead cells. The two types of T cells are helper T cells and cytotoxic T cells. The major function of the helper T cells is to activate cytotoxic T cells and B cells. The cytotoxic T cells destroy pathogens by phagocytosis. B cells produce and secrete antibodies, activating the immune system to destroy the pathogens. The main difference between T cells and B cells is that T cells can only recognize viral antigens outside the infected cells whereas B cells can recognize the surface antigens of bacteria and viruses. T cells are a type of lymphocytes that develop in the thymus. They are also called T lymphocytes. These cells are primarily produced in the bone marrow and migrate to the thymus for maturation. The immature T cells differentiate into three types of T Cells: helper T cell, cytotoxic T cells, and suppressor T cells. The helper T cells primarily recognize antigens and activate both cytotoxic T cells and B cells. The B cells secrete antibodies and cytotoxic T cells destroy the infected cells by apoptosis. The suppressor T cells modulate the immune system in such a way to tolerate the self-antigens, preventing autoimmune diseases. Both helper and cytotoxic T cells recognize various antigens in the circulation system, which are shredded by pathogens. These antigens should be presented on the surfaces of the antigen presenting cell (APS). Macrophages, dendritic cells, Langerhans cells, and B cells are the types of APSs. These APSs phagocytize pathogens and present the epitopes on their surfaces. The molecules that present those epitopes on the surface of the APSs are called major histocompatibility complexes (MHC). The two types of MHC complexes are MHC class I and MHC class II. The MHC class I molecules occur on the surface of the cytotoxic T cells while MHC class II molecules occur on the surface of the helper T cells. The T cell receptors (TCR) of the T cells bond with the MHC molecules on the APSs. Two types of coreceptors can also be identified, stabilizing this binding. They are CD4 coreceptor and CD8 coreceptor. The CD4 coreceptors occur on the surfaces of the helper T cells and the CD8 coreceptors occur on the surface of the cytotoxic T cells. The CD3 molecules on the surface of the cytotoxic T cells transmit the signals to the cell about the binding of the MHC complex to the T cell. Various types of T cell receptors (TCR) occur on the surface of the T cells to specifically recognize each type of antigen. Therefore, the immunity triggered by T cells is specific to the type of pathogen; hence, it is called the cell-mediated immunity (CMI). The cell-mediated immunity is a type of adaptive immunity. The function of the helper T cells and cytotoxic T cells is shown in figure 1. B cells are the other type of lymphocytes produced and develop in the bone marrow. B cells are also called B lymphocytes. They mediate the humoral or the antibody-mediated immunity (AMI). That means B cells produce antigen-specific immunoglobulin (Ig) or antibodies, which are directed against the invaded pathogens. The naïve B cells can bind to antigens on the circulation through B cell receptors (BCR) present on the surface. This binding promotes the differentiation of the naïve B cells into antibody-producing plasma cells and memory cells. Some antigen types require the participation of T helper cells with the plasma cells to produce antibodies. These type of antigens are called T-dependent antigens. But, some antigens are T-independent antigens. When a plasma cell binds to a T-dependent antigen, the helper T cells, which contain CD4 coreceptors, stimulate the production of antibodies. The T-dependent antigens produce antibodies with high affinity. In contrast, the T-independent antigens trigger the production of low-affinity antibodies. The T-independent pathway mainly produces IgG and IgM antibodies. But, the immunoglobulin produced in response to the T-dependent pathway are more specific. The formation of plasma cells by the T-dependent antibodies is shown in figure 2. The primary immune response and the secondary immune response are the two types of immune responses generated by B cells against an antigen. The primary immune response is generated by the naïve B cells whereas the secondary immune response is generated by the memory B cells. Both T cells and B cells originate from the bone marrow. Both T cells and B cells are the two types of lymphocytes. Since both T cells and B cells are subtypes of white blood cells, both cells occur in the blood. Both T cells and B cells also occur in the lymphatic system. Both T cells and B cells are involved in the adaptive immunity. Both T cells and B cells can recognize the various pathogenic antigens. T Cells: T cells are a type of lymphocyte, which develops in the thymus, circulates in the blood and lymph and mediates the immune response against malignant or infected cells in the body by the secretion of lymphokines or by direct contact. B Cells: B cells are a type of lymphocyte, which develops in the bone marrow, circulates in the blood and lymph, and upon recognizing a particular pathogen, differentiates into a plasma cell clone, secreting specific antibodies and a memory cell clone, for the subsequent encountering of the same pathogen. T Cells: T cells originate in the bone marrow and mature in the thymus. B Cells: B cells originate and mature in the bone marrow. T Cells: Mature T cells occur inside the lymph nodes. B Cells: Mature B cells occur outside the lymph nodes. T Cells: T cells bear TCR receptor. B Cells: B cells bear BCR receptor. T Cells: T cells recognize viral antigens on the outside of the infected cells. B Cells: B cells recognize antigens on the surface of the bacteria and viruses. T Cells: T cells occur in the parafollicular areas of the cortex of the lymph nodes and the periarteriolar lymphoid sheath of the spleen. B Cells: B cells occur in the germinal centers, subcapsular and medullary cords of lymph nodes, spleen, gut, and the respiratory tract. T Cells: The T cells have longer lifespans. B Cells: The lifespan of the B cells is short. T Cells: The T cells lack surface antigens. B Cells: The B cells have surface antigens. T Cells: The T cells secrete lymphokines. B Cells: The B cells secrete antibodies. 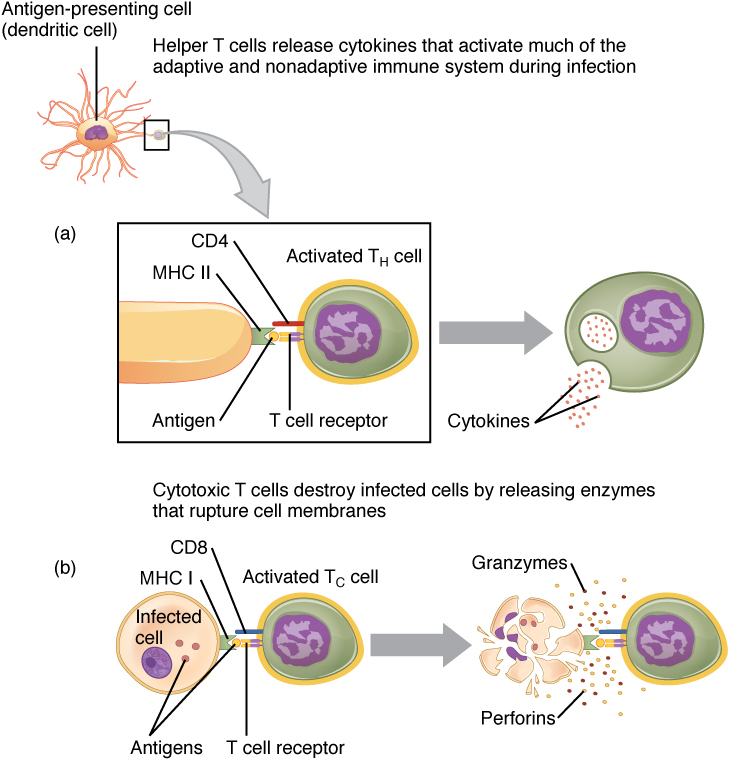 T Cells: The T cells are involved in the cell-mediated immunity (CMI). B Cells: The B cells are involved in the humoral or the antibody-mediated immunity (AMI). T Cells: The 80% of the blood lymphocytes are T cells. B Cells: The 20% of the blood lymphocytes are B cells. T Cells: The three types of T cells are helper T cells, cytotoxic T cells, and suppressor T cells. B Cells: The two types of B cells are plasma cells and memory cells. T Cells: The T cells move to the site of infection. B Cells: The B cells do not move to the site of infection. T Cells: The T cells act against tumor cells and transplants. B Cells: The B cells do not act against tumor cells or transplants. T Cells: The suppressor T cells have an inhibitory effect on the immune system. B Cells: The B cells do not have any inhibitory effect on the immune system. T Cells: The T cells defend against the pathogens including viruses, protists, and fungi that enter the cells in the body. B Cells: The B cells defend against bacteria and viruses in the bloodstream or lymph. T cells and B cells are two types of lymphocytes which trigger an immune response against foreign materials in the body. T cells recognize the foreign antigens on the surface of the APSs. The helper T cells stimulate the production of antibodies by plasma cells. The cytotoxic T cells destroy pathogens by inducing the apoptosis. The B cells produce specific antibodies to different pathogens, by recognizing the antigens in the circulation system. The main difference between T cells and B cells is their method of recognizing antigens. 1.“T Cells.” British Society for Immunology, Available here. Accessed 19 Sept. 2017. 2. Alberts, Bruce. “B Cells and Antibodies.” Molecular Biology of the Cell. 4th edition., U.S. National Library of Medicine, 1 Jan. 1970, Available here. Accessed 19 Sept. 2017.